The best known attraction in St. Louis is, hands down, the Gateway Arch. And no matter what people say, you don’t have to be a tourist to go visit it. 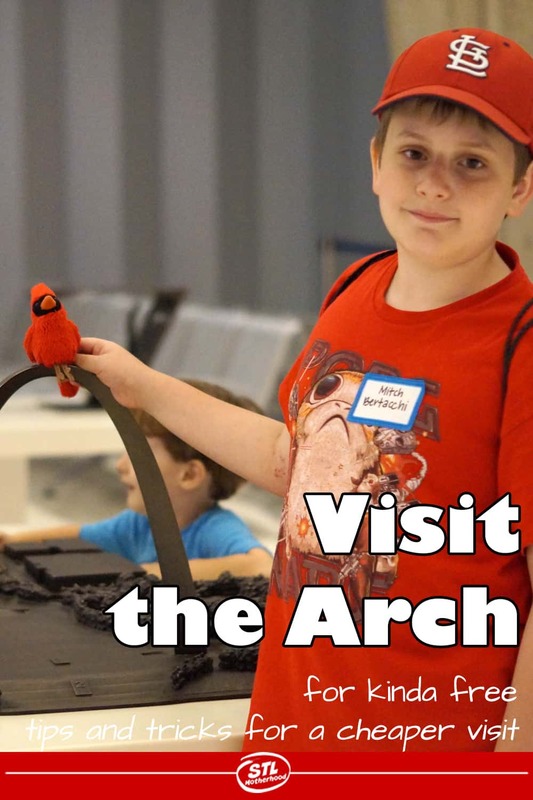 Kids love seeing the Arch up close–its just so…dang…big. But can you see the Gateway Arch for Free? The Gateway Arch is a man-made monument on a national park formally called the Jefferson National Expansion Memorial, which was kinda confusing to out-of-towners and locals alike. Locals just called it the Arch it you were going to the monument or the Arch Grounds if you were visiting a festival on the parkland under the Arch. Congress recently cleared things up by renaming the park the “Gateway Arch National Park.” The park also includes the Old Courthouse and all the greenspace between. Get insider info on parking, the hubbub about the new entrance and the all new museum! 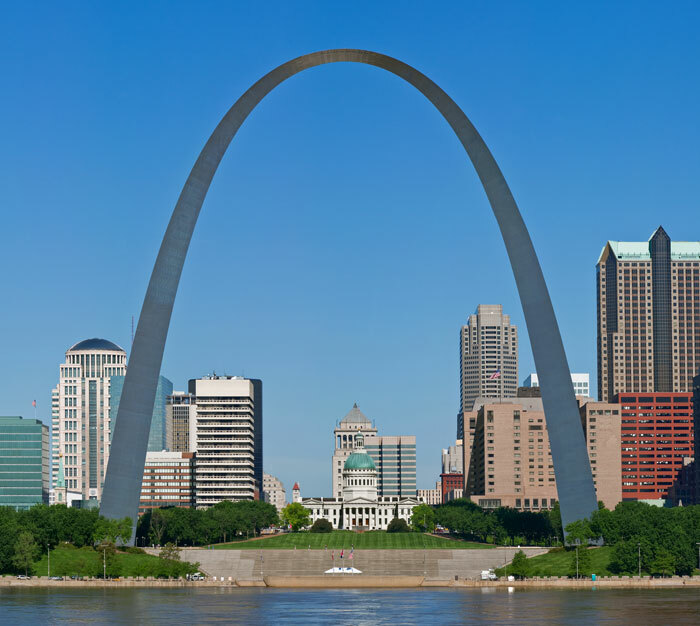 The Arch has been here since the 1965 and it’s 630 feet tall and 630 feet wide with about 190 tons of stainless steel. And yes, it does sway in the wind. But just a little bit. 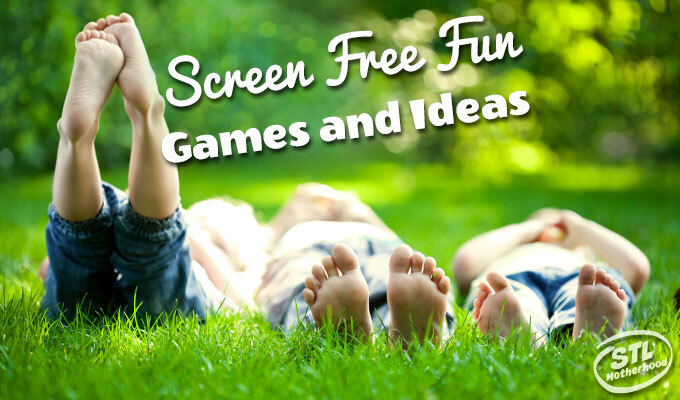 Looking for more free fun in St. Louis? I’ve got a HUGE list of the best free fun here. Arch Construction Disruption is OVER! 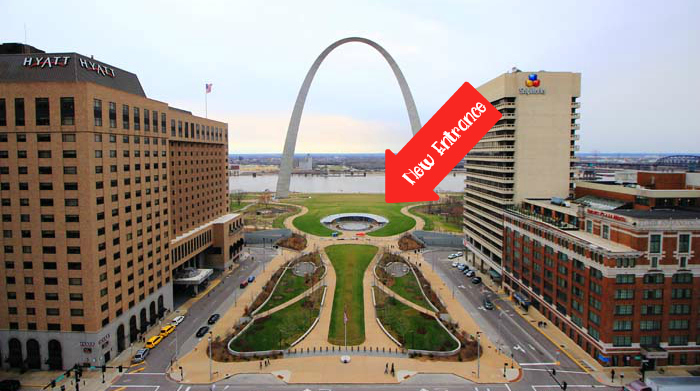 The Arch grounds, excuse me, the Gateway Arch National Park, just completed a big overhaul of the entire park. It’s been plaguing visitors for YEARS but lucky you–it’s done! We now have a new museum, new landscaping and a new front door for our beloved Arch. The new museum opened to the public on July 3, 2018. Read more about the new stuff here. The old parking garage to the north of the Arch has been torn down to make room for more green space and cool park features. You now need to park downtown. I did the math once, and the length of your walk is the same if you park at the Stadium East garage. So no biggie. 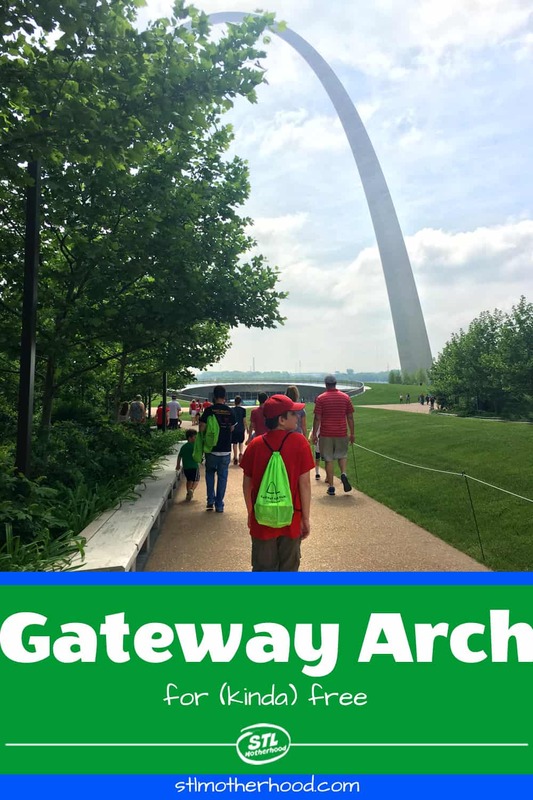 Visiting the Gateway Arch is FREE. You can enter the Arch grounds, visit the museum and walk through a replica of the observation deck totally free. Tram tickets to the top start at $12 for adults, $8 for kids 3 to 15 and $9 for people with an America the Beautiful Pass. Yes, there are coupons available for a discount off kids tram tickets! Kids are anyone under 15, and children 2 and under are always free. The Arch now has “peak pricing.” That means you can save money if you visit during slow times of the year. Obviously this is going to be easier for locals, since we can arrange to visit on a weekday in the spring…but if you’re planning a summer visit you’ll miss out on discount pricing. 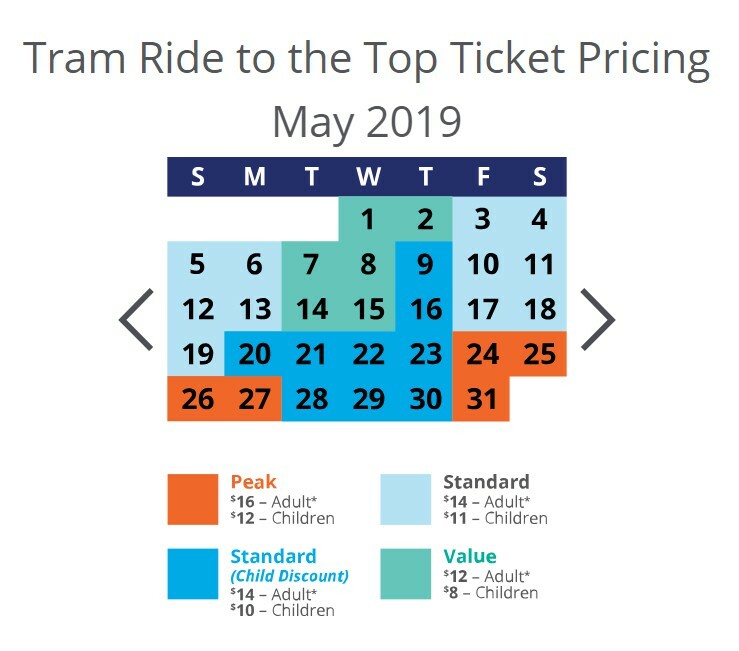 Here’s a sample pricing chart for May 2019, right at the start of summer vacation. 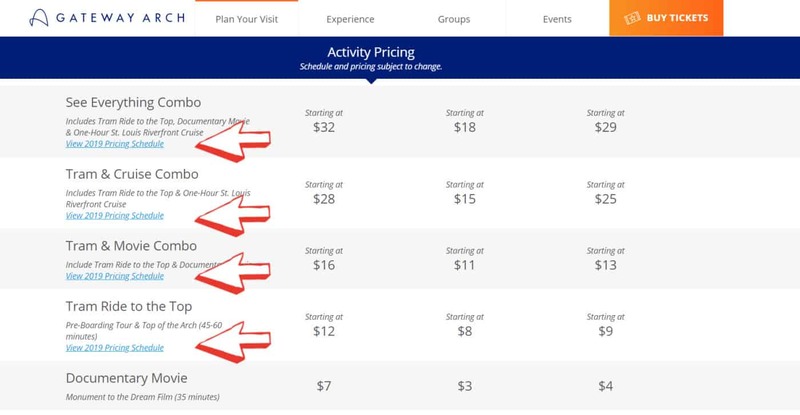 You can see a month like May has both “value” pricing days, days with kid discounts and more expensive peak pricing. If you want to find the cheapest time to visit the Gateway Arch, go to GatewayArch.com/plan-your-visit and click the blue text I’ve pointed out in the image below. Parking is also going to cost you, especially since the city decided to get rid of free street parking on weekends. I recommend the Stadium East garage, but you might score a metered spot along Market Street or nearby. Of course you could always visit the Arch without going up to the top, in which case you’d only pay for parking. But what fun is that? The Arch gets pretty crowded during the summer months when there are a lot of out-of-town visitors. The best time for locals to visit the Arch would be during the winter, spring and fall. Or just be ready for a crowd if you go in the summer! Security is tight at the Arch (something about it being a national landmark and all that) so expect airport level security. 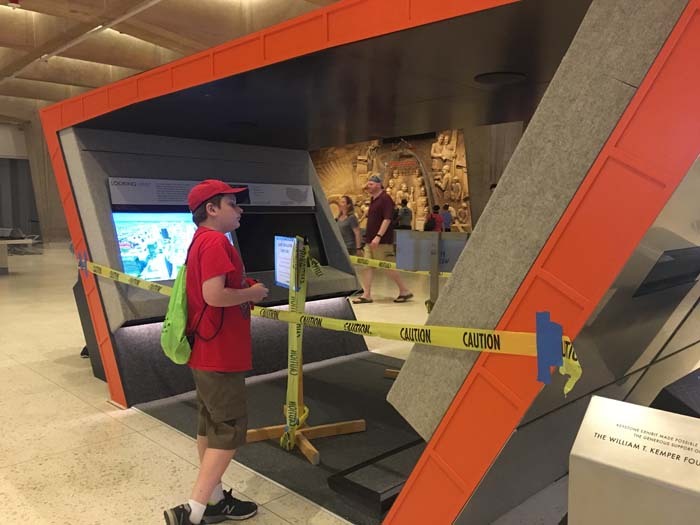 You’ll go through a metal detector and can not bring anything pointy and menacing–like a pocket knife–into the Arch. Want more freebies? How about how to see the Magic House for free or this big list of Free things to Do in St. Louis?